The British Broadcasting Corporation (BBC) Northern Ireland has announced plans to remain in its listed Belfast Headquarters, Broadcasting House, with an investment of £77M. Belfast City Council are to hold a special meeting tonight to determine 12 applications forming part of City Centre Regeneration- formerly Royal Exchange plans. Straid Congregational Church is saved by Building Preservation Notice, despite moves towards its demolition. UAHS is delighted to introduce our new publication 'Glamour and Gloom: 1930s Architecture in Belfast' - get your copy in time for Christmas! Are Developers’ ‘land banks’ of Northern Ireland’s precious Historic Buildings insured against Fire? UAHS asks ‘if not why not’ in light of repeat Donegal Street fires and the ongoing loss of some of our most important architectural assets. The search for Northern Ireland’s first Heritage Angels is moving forward with the final Heritage Angel Awards shortlist revealed today. 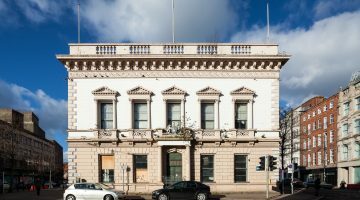 As application is submitted for 'Phase 1B' of the ‘Belfast City Centre Regeneration’, formerly ‘Royal Exchange’, UAHS speaks out about the application process, and the effect proposals would, if approved, have on Belfast and its heritage. The case of Seacoast Cottage serves to shine a light on the lack of funding available to protect some of Northern Ireland’s most important historic buildings.